School has been in session for only a few weeks, yet our students have settled in so effortlessly that the teachers and I have to remind ourselves that we are still very early into the school year. We need to give our students ample time to fully settle in and adjust to new expectations and experiences. As parents, I trust you are adjusting to your new routines and experiences as well. I hope all parents have taken time to review the Lower School Parent Handbook. In the "Community" section under Behavior and Discipline, the handbook states: We trust that students will prove themselves responsible to get themselves where they need to be and take care of their belongings. We are asking students, at all ages, to take responsibility for their actions and manage themselves. I realize this is hard to do; we hate to see our children falter. It takes great restraint to step aside and let them do things on their own, particularly when we know the outcome won't be favorable. Sceptics will question our vigilance in care, but I can assure you, doing nothing takes far more effort than taking control of a situation. If you're hesitant to try this approach, start with small steps (e.g., letting your child lead his or her bedtime routine rather than you). Again, much easier said than done. Evidence of challenging our students to think for themselves can be seen during our unstructured play time. In allowing our students to interact with different ages, explore campus, and choose activities, we are already seeing an increase in problem-solving, self-regulation, and awareness. Throughout the year, we will continue to not only challenge our students, but also challenge you to trust in your child and in the process. You may experience an initial increase of "not so shining" moments, but the payout, the pride you'll feel in your child's growth and accomplishments, is worth letting go. NPR recently published a piece on promoting confident, independent kids by embracing the "Let Grow" movement. As they put it, "always helping our kids isn't always helping them." Click here to read the NPR article. Well worth the read. Remember, I am always available to help and support you. Stop in any time to chat. 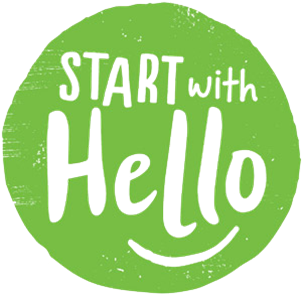 During the week of September 24th-28th, our school will participate, along with hundreds of other schools in the US, in "Start with Hello" week. Start with Hello teaches students the skills they need to reach out to and include those who may be feeling left out, lonely, or invisible (a term referred to as social isolation). By doing so, we are creating a culture of inclusion and connectedness within our school. To begin, classroom activities will be led by our school support team beginning the week of September 17th in grades 2-4. Teachers will be given further resources to continue this effort throughout the school year. All grades in the LS will be visiting another classroom, which could be in the MS and/or US to "Start with Hello". When students visit another classroom, they will start by reading a poem to the class they are visiting (similar to a rhyme you may have heard if you've been "booed" in your neighborhood). Then, students will exchange hello greetings and offer a green "Start with Hello" button/pin to the members of the class that they visit. This will be a great opportunity for students in the lower school to practice their House Focus, which has been to use the S.P.E.C.I.A.L. acronym (Shake hands, Posture, Eye Contact, Charm, Introduce Yourself, Ask a Question, and Lean in and listen) when greeting others. Next, the "Helloing" continues by the classroom that was just visited choosing another classroom to tag and say hello. Be sure to look out for the "Start with Hello" poem posted outside your child's classroom to recognize if they've had a visit yet and ask them about it! We are very excited to participate in this effort! It is our sincere hope that we can contribute positively to our students' social development. It might seem simple, but the gesture of saying hello may not only impact someone's day, but their life. All we have to do is "Start with Hello".